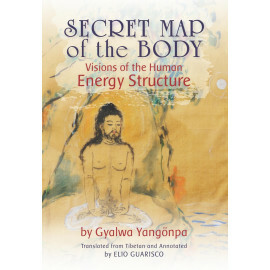 Yangönpa’s Hidden Description of The Vajra Body presents the triad constituting the Vajra Body – the channels, energy-winds, and vital essences – as the basis for the application of experiential yogic techniques. Yangönpa’s Hidden Description of The Vajra Body presents the triad constituting the Vajra Body – the channels, energy-winds, and vital essences – as the basis for the application of experiential yogic techniques. Buddhism often relegates the body to a role subordinate to that of the mind; the focus of Yangönpa’s Hidden Description is the body itself, with its manifold layers – coarse, subtle, and very subtle. In his presentation of the human body’s energetic structure he contends that it is not simply the means to achieve enlightenment, but enlightenment itself, blending the Highest Tantra notion of the body as the method with the Total Perfection (rdzogs chen) principle of inherently present enlightenment as the fundamental nature of all phenomena. GYALWA YANGÖNPA realized the nature of mind at the age of eight upon hearing instructions on the Dzogchen mind cycle of teachings. And at age nine he was installed as the abbot of Lhadong monastery, where he gave profound religious discourses, establishing his reputation as an enlightened emanation. During his lifetime, 1213-1258, he was devoted to four precious masters of different lineages. Under the guidance of the first two, he undertook solitary retreat and, following a clear vision of the energetic system of body and mind, came to master this inseparable matrix. An exceptional being gifted with powers, knowledge, and wisdom, Yangönpa led an exemplary life and his spiritual achievements won him a large number of followers. His literary output left a mark in the writings of later masters of all Tibetan schools, including Tsongkhapa, the Eighth Karmapa, Jamgön Kongtrul Lodrö Thaye, Raga Asya, and Jigmed Lingpa. This book presents for the first time the translation of two texts, the biography of Yangönpa, The Great Mirror, and his short but illuminating treatise Hidden Description of the Vajra Body. Take your understanding of the subtle body to the next level, simple the best book on the subject. The detail is astounding and I doubt you'll find better than this book.